About halfway through the new film Crazy Heart, as Bad Blake (Jeff Bridges) plays a brand-new song for Jean (Maggie Gyllenhaal), she tells him that she thinks she has heard it before. Bad replies that the good ones always sound familiar. That exchange stayed with me long after the film was over because this one — with its story of an older, down-on-his-luck, washed-up musician who finds love and one last chance at artistic redemption thanks to a younger woman — is both familiar and good. Crazy Heart boasts an impressive, lived-in performance by Bridges and has award-winning songwriter and producer T-Bone Burnett (O Brother, Where Art Thou?, among other films) working behind the scenes. Both assets are the main reasons to see the film. Gyllenhaal, Robert Duvall, and (in an unbilled, small but pivotal role), Colin Farrell round out the main cast, and the music is so good and has such a presence in the film that it becomes a character itself. “So where’d all those songs come from?” Jean asks Bad at one point. “Life, unfortunately” is the reply. Suffice it to say, the change in Bad’s fortunes is good for him and good for us. 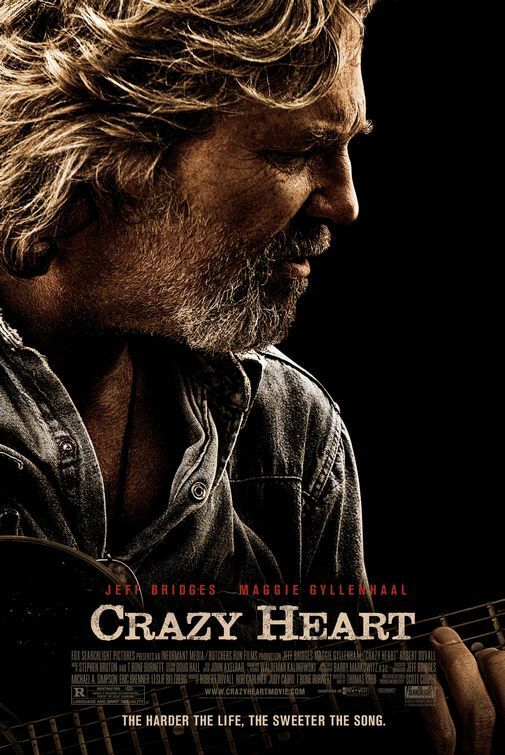 Crazy Heart may not be one of those rock-your-world films, but it’s worth seeing. I’m giving it a B+.